Whether a basketball player remains calm or experiences performance jitters depends on how effectively he responds emotionally to daily situations when something is at stake. If he hasn’t developed the skills to deal with pressure outside the court, he’s likely to feel anxious at the thought that if he misses a shot, he will hurt his team. Some relaxation techniques have been found to be effective at helping athletes, including basketball players, to stay calm. Practicing them before the game makes it easier to put them to use when you need them. Lie down on your back and inhale into your belly. Exhale. Repeat several times until your breathing becomes more relaxed and its pace slows. Visualize your muscles letting go of tension one at a time on each out breath. Start by relaxing your facial muscles and work your way down to your torso, abdomen and lower-body muscles. Alternatively, tighten each muscle group for five seconds and then release them, allowing the muscles to fully relax. Repeat five times. Practice your breathing and muscle relaxation exercises daily. Gain control of your performance anxiety by doing the breathing technique while playing basketball. Breathe in to your belly and then exhale. Obviously, you don't need to lie down to do this. Start the deep breathing as soon as you begin to fear you can’t dribble the ball or beat the defender, for example. Close your eyes and begin to breathe deeply. Slowly fill your belly with air and gradually exhale. Breathe in and out like this a few times until you start feeling more relaxed. Imagine yourself playing a successful game of basketball as you continue to breathe in and out. See yourself dunking, skillfully stealing the ball from the opponent or blocking shots. Recall the positive images you visualized whenever you begin to feel stressed on the basketball court to regain calm and confidence in your playing skills. Go to every basketball practice and do drills -- dribble, shoot, block and assist -- to hone your skills. If you feel prepared for the game, you are more likely to feel confident when playing. Get enough sleep and eat a healthy diet. Both habits generate abundant energy for your game. 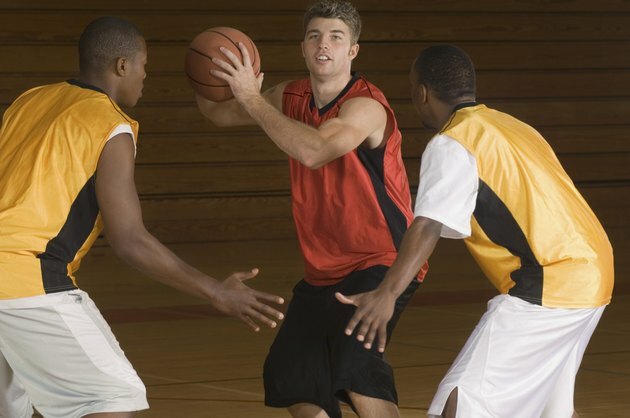 This can help you stay alert for well-timed assists, for example, and your successful performance on the basketball court can help keep stress at bay. Let poor performances of the past stay in the past. Use positive statements, such as “I can do this,” whenever memories of a badly played game creep in. Remind yourself of all your successful shots, dribbles and guarding and play on.